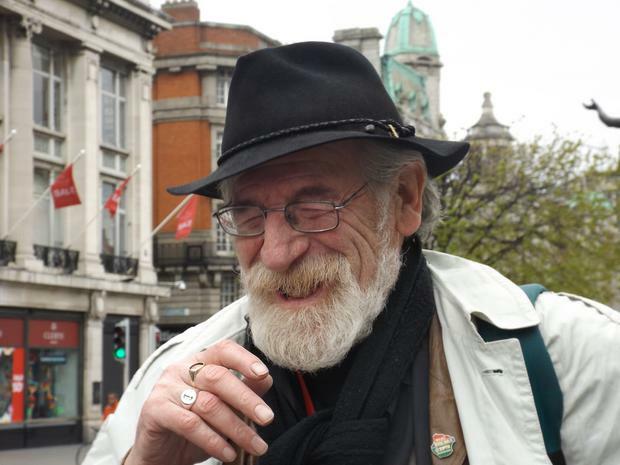 Actor, activist, artist and raconteur Jer O’Leary has been remembered at his funeral as a man who lived many lives in one. During his film career he starred in many blockbusters including My Left Foot, Michael Collins, In The Name Of The Father, and Braveheart. 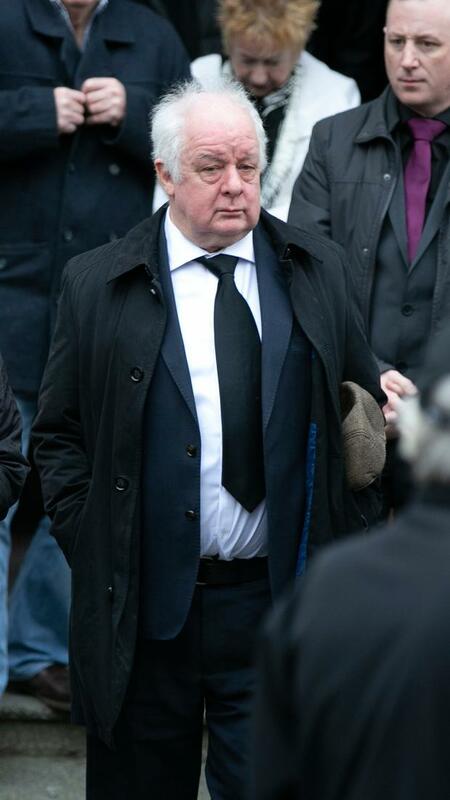 O’Leary (73) died peacefully at home in Dublin’s North Strand on St Stephen’s Day. He was well known on stage and screen and rose to fame for his stage portrayal of trade union leader Big Jim Larkin in 1975. He appeared in more than 40 films and one of his more recent roles was in the TV fantasy series Game Of Thrones. O’Leary worked on three films with director Neil Jordan and appeared in three major films with the renowned Daniel Day Lewis. He shared the set twice with John Hurt and once with the towering presence of Richard Harris on ‘The Field’ as the King of the Tinkers. 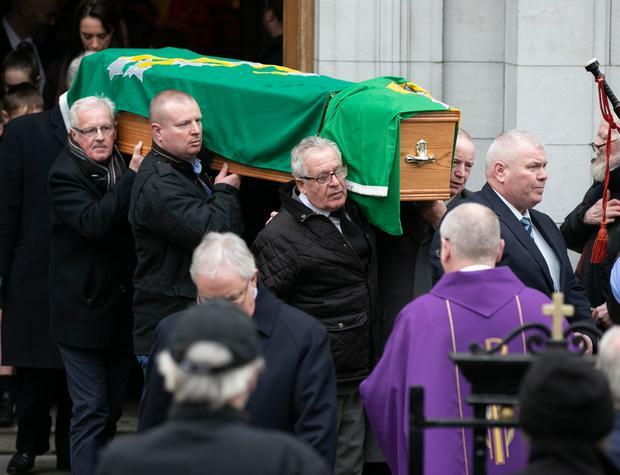 His coffin, which was draped in a Plough and Stars banner, was carried into the Church of St Agatha’s in North Strand to the song The Foggy Dew. Political banners which he had made during his days of political and labour activism were also paraded as his remains were brought to the church. Symbols brought to the altar to represent Jer’s life included a CD of The Good, The Bad and The Ugly; a Bohemians scarf; Jer’s favourite hat; a history book; and pencils and sketching materials to represent his artistic side. Fr Brendan Kealy told a tale of how Jer enjoyed a drink and a chaser and would say the only way to cure a hangover in the morning was to get up in the afternoon. Jer’s sister Margaret paid tribute to him after the mass, outlining his full life lived with dedication and humour. “Jer’s interest in films and acting was sparked by our weekly visit with all the local kids to the Drum or the Boh cinemas, sometimes even both if we could get the money by collecting enough jam jars and bottles to sell back to the shops. “Again it was always Westerns with all the kids acting out the latest film on the way back home, with dramatic death scenes on the grass verges along Drumcondra Road,” she said. He left school at 14 and got a job as a messenger boy with the Irish Yeast Company shop on College Street, and later with the RGDATA group. It was through playing football that he met Jim Sheridan. His politically related activities led to a three-year sentence in Mountjoy, which indirectly led to the commencement of his career as a banner artist. “Our Jer was just an ordinary bloke, to whom nature gave many talents and those talents and his commitment were made available to the benefit of all who asked,” said Margaret. “Jer’s favourite quote was that , ‘lf you have not been involved in the passions of your time you have not lived’. Jer followed through on that belief and the presence of so many colleagues and friends here today is a testament to that,” she added. A message from President Michael D Higgins was read from the altar, in which he said anyone who knew Jer would remember him him as “an actor, an activist and an orator”. “Known for his film and television work in a variety of roles, and in particularly the seminal work of directors Jim Sheridan and Neil Jordan and as trade union leader Jim Larkin Jer O’Leary will be forever remembered for his unstinting political activism,” his message added. Chief mourners were his daughters Nora and Clare, sons-in-law Dave and Richie, and grandchildren Conor, Liam, Erin, Seán and Luke. He was predeceased by his wife Eithne and son Diarmuid. The funeral was attended by Lord Mayor Nial Ring and the aide-de-camp of the President, Derek Fox. 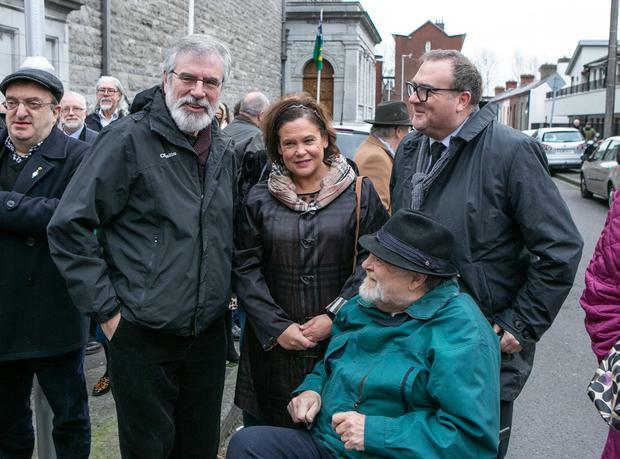 Others in attendance were Sinn Fein’s Mary Lou McDonald and Gerry Adams; playwright and politician Mannis Flynn; local councillor Christy Burke; and former Olympic Council of Ireland President Pat Hickey. Following the funeral mass his remains were brought to Dardistown cemetery for burial.